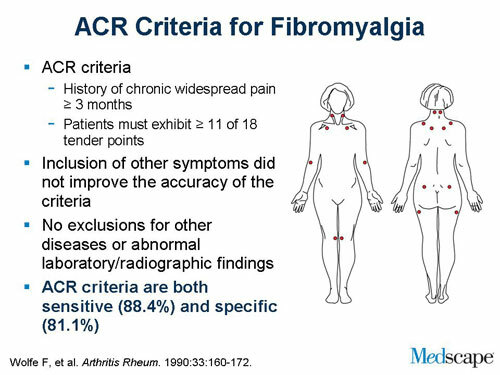 Based on comparing patients with similar but non-fibromyalgia pain complaints, the American College of Rheumatology (ACR) - committee found that the presence of widespread pain (WSP) combined with at least 11 of 18 tender points best separated patients with fibromyalgia (FM)and controls, even though some combinations of symptoms (e.g., fatigue, cognitive problems) were not evaluated. This occurred because the authors did not recognize the importance of these symptoms at the time of the study. The authors suggested that the presence of 11 of 18 tender points and the simultaneous presence of WSP for at least 3 months should be the classification criteria for FM. Initially intended for research purposes, the criteria were later widely used in clinical diagnosis, particularly among rheumatologists; they were also used in basic science and clinical studies. The endorsement by the ACR aided in establishing FM as a respectable clinical diagnosis. The reliability and validity of the TP examination outside the context of FMS specialized rheumatology settings was never tested.